Dieback devastation in Western Australia forests; Containing the spread of the disease. WalkGPS. WA’s forests, woodlands and heathlands are being devastated by an introduced disease caused by a fungus, Phytophthora cinnamomi. The disease causes the ‘Phytophthora dieback’ symptom and kills susceptible plants, such as banksias, jarrah and grass trees. At least 20% of the jarrah forest is infected (and up to 80% of the Stirling Range National Park). There is no known cure for Dieback so it is vital to contain its spread where possible. The movement of soil and mud spreads the disease, so it is important bushwalkers take special care not to spread soil or mud on footwear or by vehicles. Prepare a dieback hygiene kit and use it when entering and exiting bushland. 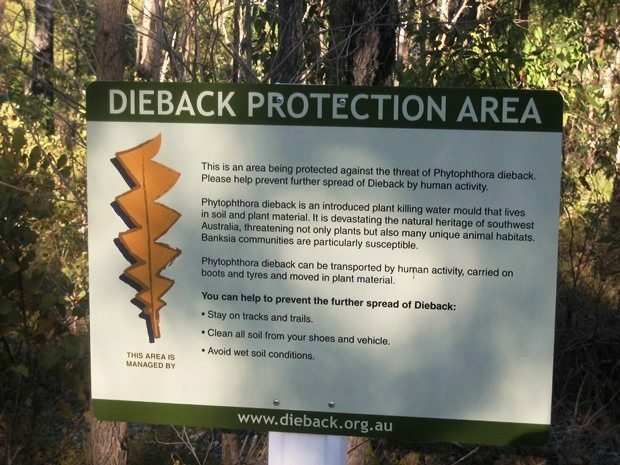 Take heed of signs alerting of the presence of dieback fungi and stay out of dieback restricted areas. Don’t enter disease risk areas during, or for three days after, rain. Avoid wet and muddy areas (on track or off track). Be prepared to change the route of your walk during or after warm, wet weather. If muddy areas cannot be avoided, remove the mud from your boots before moving onto dry or higher ground. Avoid walking along illegal off-road trail-bike/quad bike tracks. These have become widespread through vulnerable areas and will have become a major contributor to the spread of the disease. Don’t drive on bush roads that have restricted access due to the risk of dieback. (If you do, you must be in possession of a current vehicle access permit and comply with the restrictions attached to the permit.) All the walk areas on WalkGPS can be reached without driving on restricted access roads. Clean boots (and tent pegs) thoroughly before and after all walks. Also check Bushwalking WA for recommended practices for bushwalkers to follow when venturing into dieback affected areas.